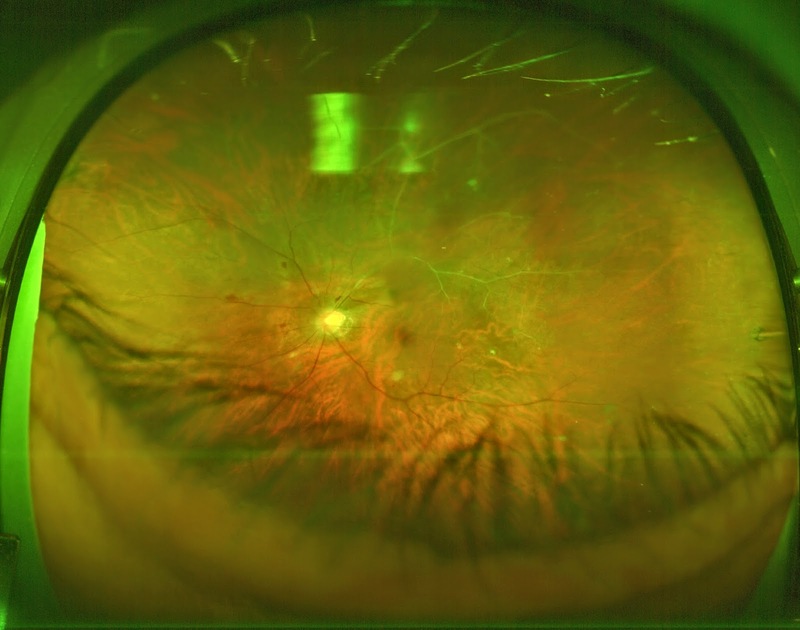 I am often asked by patients: Can you see if I have other medical problems just by looking in the eye? Let's start with vision. What we can see at the sides while gazing straight ahead is called our visual field. Normally we can see things about 120 degrees horizontally out in front of us, while vertically the visual field extends about 30-40 degrees. When conditions affect the nerve of the eye, the visual field is often affected. The pattern of visual field loss can offer vital clues as to the underlying problem. For example, if the sides are affected and this loss stops abruptly at the midline, there might be a growth pressing on the nerve of the eye. Diabetes is a condition which affects most if not all parts of the eye if it is not controlled well. 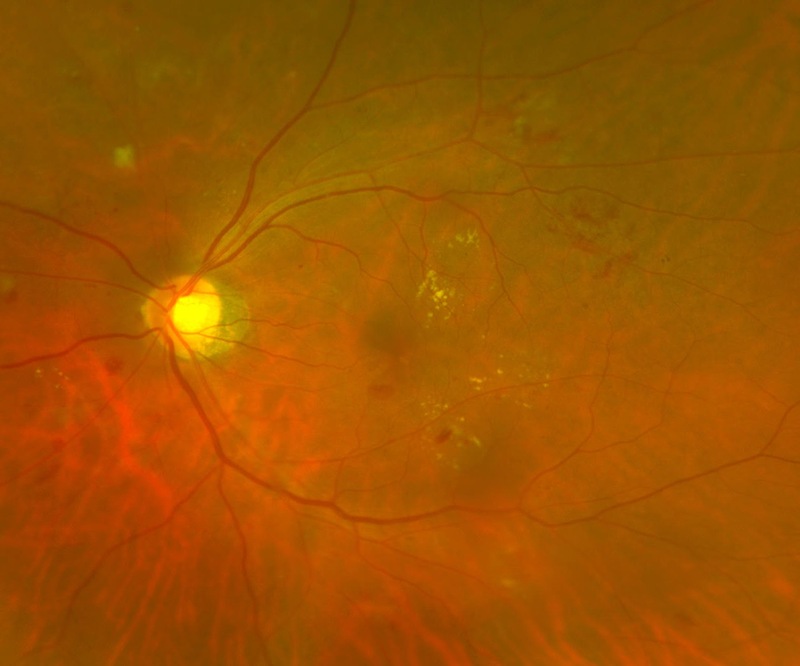 The most well known problems have to do with retinal bleeding, which starts off with small spots of blood and fluid/cholesterol leaking into the retina, which is the thin film at the back of the eye. Later on, if it becomes more severe, new blood vessels can grow that cause more severe bleeding and scarring. The most important factor in avoiding eye disease among diabetics is controlling the level of blood sugar. Generally, the better the blood sugar is controlled, the less the risk of geting eye disease, or of the eye disease getting worse. High blood pressure affects blood vessels throughout the body, but this is not usually obvious until it causes severe changes such as heart disease. 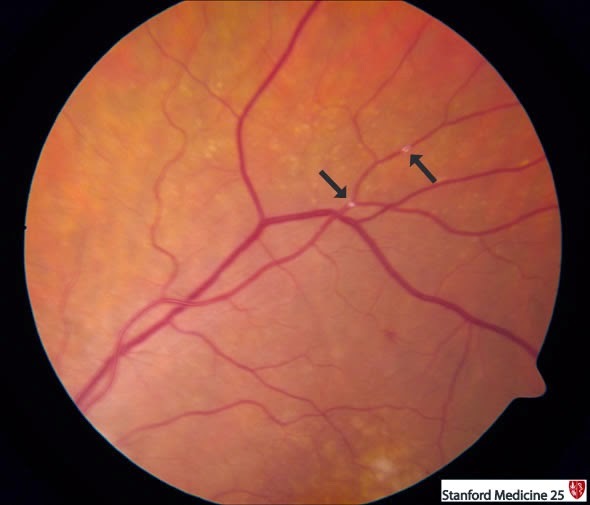 In the eye, the small blood vessels are usually examined with microscopes, and small changes may be picked up earlier. When the blood pressure is high for a long time, the arteries get thicker and can press on the veins. 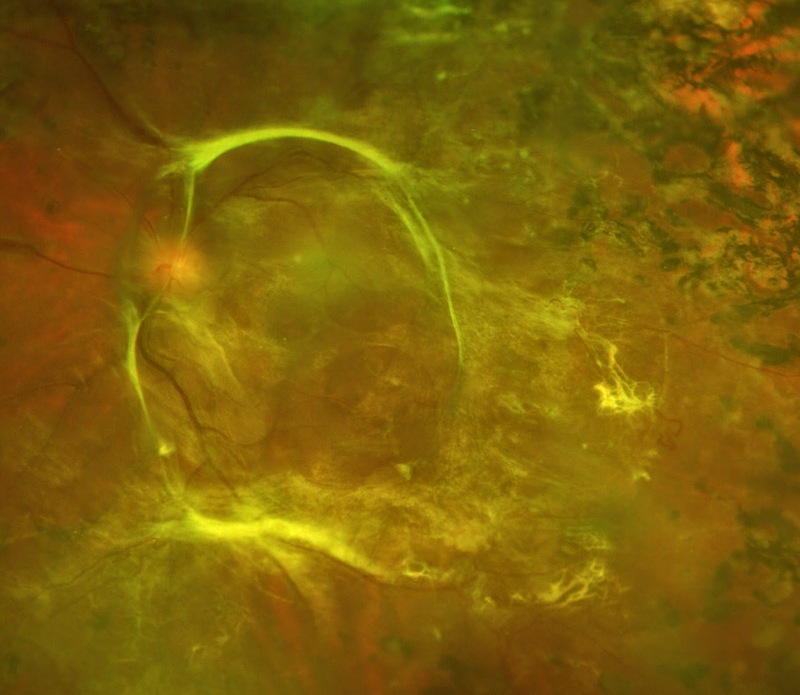 Sometimes this causes the vein to be blocked, which can lead to back pressure, bleeding in the retina, or swelling of the retina. 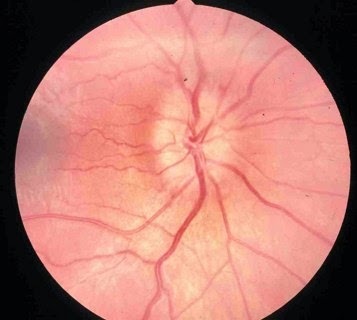 After a long time the blocked blood vessel may turn white (see below). High cholesterol levels have been associated with a greyish white ring at the side (periphery) of the cornea. Not everybody with this ring (called arcus senilis) has high cholesterol levels, but its presence suggests that one should get a blood test to make sure the level is not high. Cholesterol deposits in the neck arteries may throw off little pieces, which can travel to the brain to cause strokes, or to the blood vessels in the eye and block them. High pressures within the head may be due to a variety of conditions, such as bleeding from injury, tumour, or blockage of fluid (CSF) flow. The high pressure causes swelling of the end of the optic nerve, which is visible when the eye doctor looks inside the eye. Commonly, the high pressure also causes headaches, which may be associated with nausea and vomiting. On the other hand, most headaches are caused by other reasons, like tension or migraines. So, although we cannot actually peer into the soul by looking in the eyes, there is still plenty that we can tell by examining this part of our body, that we would otherwise have no clue about! Interesting! Didn't know that there is so much you can tell by looking at our eyes. Thanks Erin! Yes, we can tell a fair bit, but it's generally of the prosaic, nitty gritty physical type:) We're lucky that the eye has many transparent parts, so that even the tiny parts at the back can be seen. Blepharitis is not an incurable disease; rather than looking for an over the counter anti-infection, treatment or eye drops, you can find a Blepharitis Natural Treatment for apply at home. Ensure the health of your eyes by getting your entire visual requirements fulfilled from the best professionals in town. The Lafayette Doctor can solve all your eye problems without any delay! Just book an appointment with them and make yourself free from all sorts of eye diseases. Good information on your blog.. About the Eye Surgery is critical subject to my body. But latest technology is very helpful and successful for the hospitals. This technology is very costly so my country is former country. He is not offer table this costly surgery. But Dr.Rajeev Hardia Eye Surgery in indore provided this surgery is very low cost. They have very Well knowledgeable and experienced “Doctors” in these hospitals.